We have made a concerted effort (over the last few weeks) to post news regarding Zula Blue’s litter. Actually, we planned to post something weekly, but time gets away from us. They have reached the five-week mark. It is time to let you see what has transpired. They look a little different than the last viewing on the blog. Zula Blue’s pups will leave for their forever home in a few weeks. It will happen after the Christmas holiday. By then, and things will have settled a bit. It will work to everyone’s advantage. Pups arrive on a schedule that is not always ideal; females come into season every six to eight months. We are sure there are people scanning the Internet in search of a Christmas puppy. Christmas and the holidays impact our lives in unique ways. Some people find that little changes for them. They lead a quieter life, either by choice, or design. Other folks find every moment jam-packed from Thanksgiving to the New Year. These types should never add a puppy to the mix. It is irresponsible, and an unfair thing to do to a puppy. To others, the addition of the puppy is more important than the usual holiday fanfare. To say no one can do a Christmas puppy is not fair. We are not all cut from the same cloth (as the saying goes). Nonetheless, there is always a public outcry, because all too many who are caught by the puppy-under-the-tree-idea, are anxious to drop the Christmas-pup at the shelter by Easter. Beyond the holiday scenarios, there are other reasons a placement fails. Zula’s pups are promised to excellent home. Most of these folks have waited for some time to get a puppy; they look forward to beginning the new year with a new family member. Alice (Zula Blue X 2013) flew home on the big airplane with her parents. We show two photos of her; one as she left, and the other of her a few months later. She has an older sister (Emma); she is also an OwyheeStar girl. We thank Cheryl and Dave for their dedication, and loyalty. Weimaraner pups grow up fast. They go from what we might consider a mouse-sized beginning, to be adult-looking in four-months. They are by no means adult-acting; and setting expectations beyond the pup’s ability is fertile ground for disappointment. Frustration often leads to blaming, and trying to find someone to fix the perceived problems. Labels get attached, and the focus goes from embracing the new family member to fixing them. A pup, once labeled, will feed off the owner’s frustration. This in turn leads to more acting-out behavior, and a breach in the relationship. It is a combination of the two working together that produces an escalation in the unwanted behavior. Nothing is more significant than your relationship; it is the key to turning around any situation. Regardless, when things seem to awry, it is important to remember what is most important. The key to turning things around is a healthy relationship where you are gaining not only their adoration, but their respect. Did we say that the Weimaraner pup grows up fast? They go from what you might consider a mouse-sized baby beginning, to be adult-looking in four-months. They are by no means adult-acting; and setting expectations beyond the pup’s ability is fertile ground for disappointment. Wrongly labeled pups stem from one of two methodology errors–the first could be summed up as a failure to understand, and follow through. The second is the other extreme. The person who expects too much, and/or is being heavy-handed. Extremes do not produce the desired outcome. This approach is often based in a person’s ego; this is the person who feels their dog reflects their ability. We are all proud of what our dog does. Nevertheless, the person who wants the well-trained perfectly behaved pup, and they will settle for nothing less; this breed might prove beyond difficult. This is a journey. This is about what you can become together. It takes time, investment of yourself, and more than a little fortitude to get the desired result. Sending a pup off to the trainer, is more often than not, a bad move. 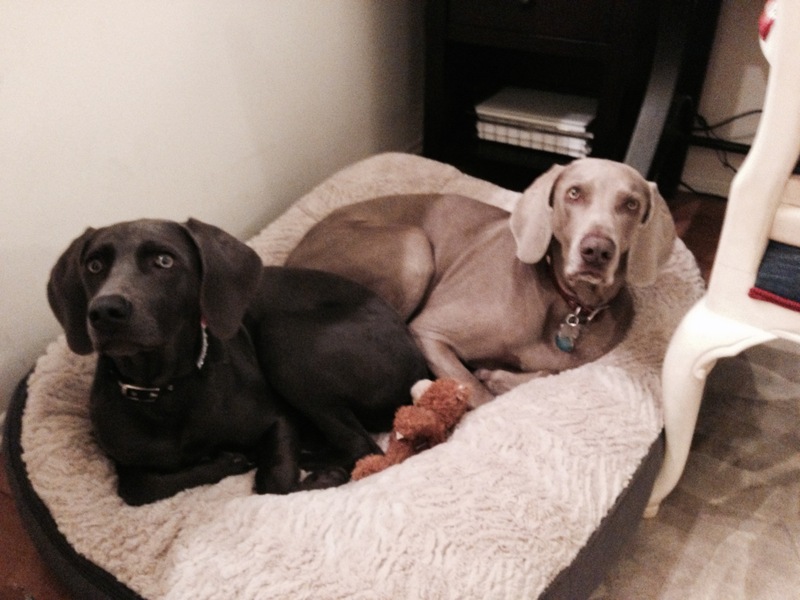 The Weimaraner is all about the relationship–you and they must find the way. Regardless, of what happens (and even if you chose to send them to a trainer), it is imperative that you are engaged with the pup. The type of leadership you provide must be one that evokes respect, and at the same time is sensitive to what works. A lot of people try to bamboozle the Weimaraner into doing what they want. Others exert pressure in order to force their dogs to obey. The Weimaraner needs to want to comply with your expectations. How do you get them to want to do your bidding? You have to invest the time, and follow through early-on. You spend time having fun together, and build this relationship. This journey is a life-time commitment. The Weimaraner is not one you train, and forget. Failure to remember them, and their special needs will end in disaster. 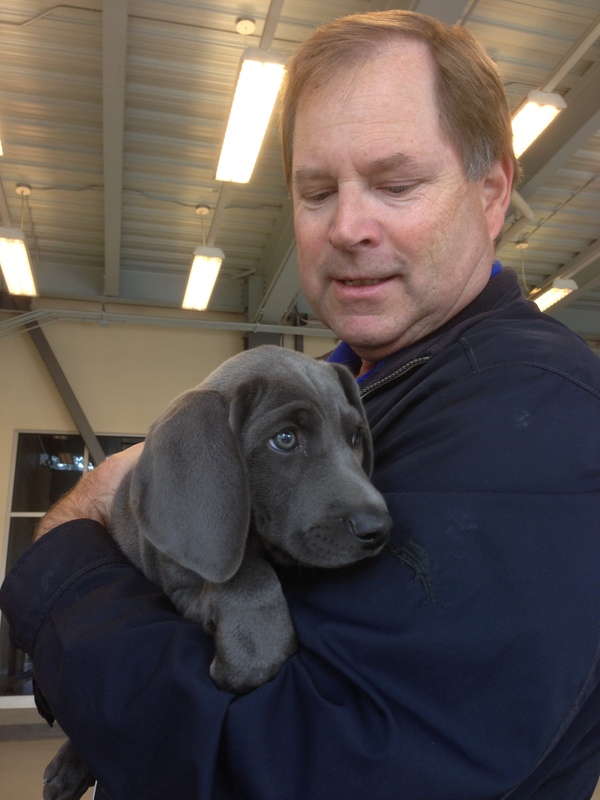 Posted on December 10, 2014, in Zula Blue X Blue and tagged Blue Weim pup, Blue Weimaraner, Five--week Weimar Pups, Gray Ghost pups, Gray Ghost Weimaraner, OwyheeStar Weimaraner puppies, Puppy Biting, Silver Gray Weim Pups, Traditional Weimaraner, Young Pups. Bookmark the permalink. 2 Comments. Those big ears-love them! Haze from Zula’s first litter has the biggest, bestest ears! !